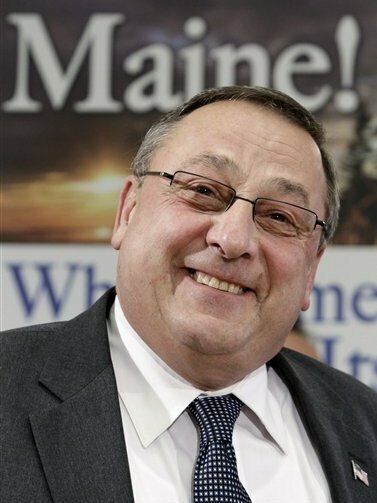 Maine Governor LePage Orders Labor History Mural Out Of State Building : It's All Politics Maine's Gov. LePage had a mural honoring union history taken down as not business friendly. For those in Maine with doubts about how their state's Gov. Paul LePage would answer the old organized labor song, "Which side are you on?" they now have their answer. LePage, a Republican who just started in his first term, ordered the removal from Maine's Labor Department building a mural depicting scenes of organized labor history in his state. He's also renaming the building's conference rooms so they no longer honor Cesar Chavez and other famous leaders of the American labor movement. LePage spokesman Dan Demeritt says the mural and the conference room names are not in keeping with the department's pro-business goals and some business owners complained. The mural was erected in 2008. It depicts several moments in Maine labor history, including a 1937 shoe mill strike in Auburn and Lewiston and "Rosie the Riveter" at the Bath Iron Works. On his official web site, Maine's Gov. Paul LePage says his goal is to "get government out of the way and allow Maine's small businesses to create jobs... and that means tearing down the roadblocks that establishment politicians have build over the past 40 years." Maybe that mural was one of the roadblocks. No word yet on whether the governor plans on trying to repeal some of those other legacies of organized labor such as the eight hour day and five-day work week.